SOCIAL ROBOTICS JAPAN is adapted from a bimonthly column published in Japan’s Nikkan Kogyo Shimbun (日刊工業新聞/Business & Technology Daily Newspaper). The 101-year-old, nationally circulated newspaper is a co-organizer of the iREX International Robot Exhibition and its biennial alternate, Japan Robot Week. The column’s generalist, socio-technological perspective aims to encourage both domestic and international conversation around developments in Japanese robotics. A deep, largely monocultural history combined with a highly contextual language and society present fascinating but considerable challenges for expatriates who call Japan home. Understanding and appreciating Japanese entertainment is one of the tallest hurdles, and Japanese anime is a perfect example. There are, of course, legions of non-Japanese anime fans around the world, but just as many find it quite impenetrable; we recently discovered a robotics-focused promotional piece that seemed yet another difficult exampleat first. The feature, Robot Town Sagami 2028, sponsored by Kanagawa Prefecture’s namesake campaign, turned out to be a very pleasant surprise. Created by Tezuka Productions, the short anime opens with the exuberant celebration of a man who just learned that he’d become a father. At the height of his excitement, however, tragedy strikes. Hospitalized in critical condition, the man finds himself floating above his comatose body, overhearing a grim diagnosis. Suddenly, a very familiar robot boy appears and transports him to an impressive but simultaneously tragic future: his wife and child, surrounded by helpful robots and an array of technological advancements, appear to be living very happily without him. This is the part where foreign audiences can easily get lost in what seems an odd, disjointed, and relative to the nature of the promotional campaign, unnecessarily melancholic narrative. Now, we won’t spoil the reason why, but we will say that anyone who watches through to the end will find a touching message that’s universally relatable in any culture. Although the setup is a bit disturbing, it ends up being fantastic storytelling, with a hopeful and heartwarming finale, imagining a not too distant future that many predict will become reality: a brave new Japanese economy where robotics and IOT technologies are embedded in everyday life – and that life is very good. 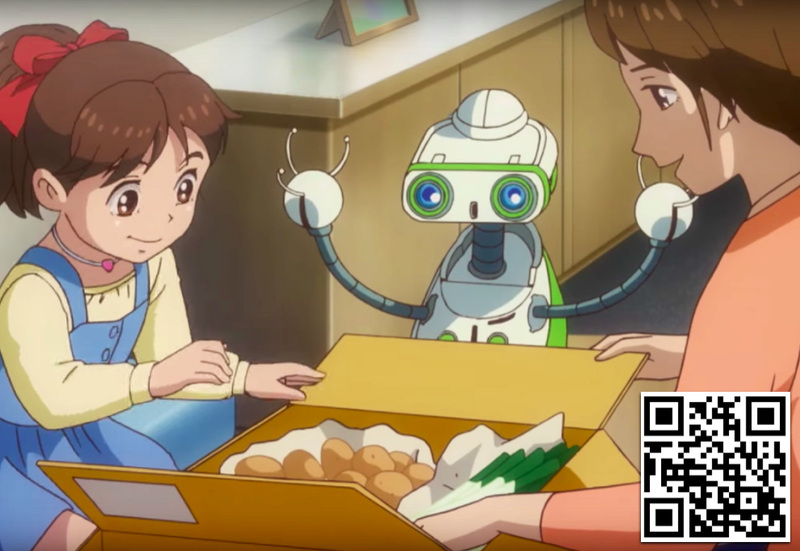 The bilingual version of Robot Town Sagami 2028 is embedded below, and Japanese or not, fan of anime or not, we think you’ll be glad you gave it a watch. The Robot Town Sagami organization is one of several municipality-wide, private and publicly funded robotics development and promotional ventures in Japan, some of which fall under a broad governmental initiative referred to as the “Robotic Technologies and Systems for Next-generation Social Infrastructures.” Other examples include Tsukuba Science City and nearby Cyberdyne, Inc.’s proposed Cybernic City (PDF).